Manly comes alive at this time of year and Garfish Manly is the perfect vantage point to enjoy spring. Delectable food paired with unbeatable views of the harbour create the perfect recipe for a memorable meal. An intimate dinner for two or a night out with a group of friends, Manly has something for everyone. It’s also the ideal time to enjoy our bar area—step off the ferry after work, enjoy a cool drink, then relax until you’re ready for your meal. Manly is now serving our new spring 2013 menu, there is a exciting selection of new dishes. We know it’s not fish, but our entrée selection of breads is proving a popular choice for our Garfish Manly diners. Sourdough served with olive oil, or woodfired focaccia with caramelised garlic and rosemary, or house made taramasalata, are perfect to enjoy with a light drink while you deliberate over your choice of seafood for mains. This Asian style entrée is an elegant and light start to any meal. It’s a great time of year for the yellowfin and it’s lightly seared, then served rare, accompanied by a complex mix of flavours. From the bite of the wasabi, to the citrus and sweetness of the yuzu and the smoothness of the avocado, this dish is layered, yet light, and we think it’s spring dining at its best. You can’t go past seared scallops and it may not be winter any more, but we believe this entrée delivers on the comfort factor. 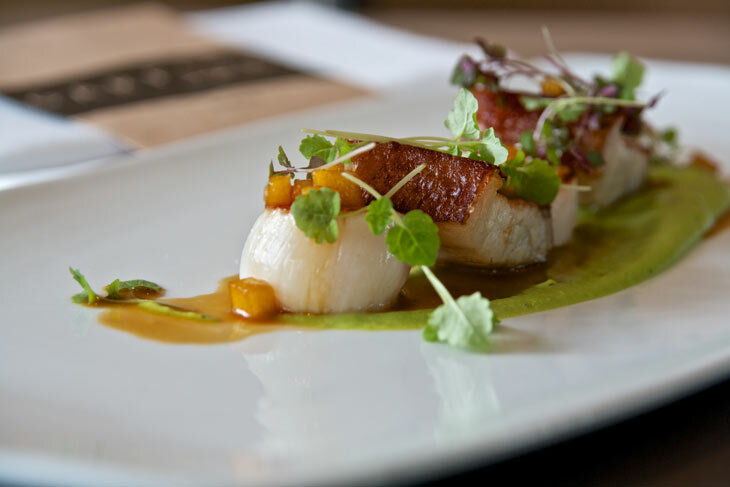 It offers light flavours perfect for spring with the sautéed, roasted granny smith apples, then combines pork belly and a smooth, light pea puree, to give you a truly satisfying beginning to your meal at Garfish. Garfish Executive Chef Stewart demonstrates this new dish from the Manly menu in this video. Yes, it’s back! Our much loved and favourite main of whole baby barra, which has developed quite a following over the past eight years. Deep fried whole and accompanied by steamed bok choy and our Thai style sauce that combines the best of sweet and spicy, this main is deliciously sticky and definitely moreish. If you’ve not yet tried it, we guarantee one taste will have you adding this to your list of favourites. Spring is worth a special mention when it comes to our selection of Moreton Bay bugs, King Prawns and live rock lobsters. They’re in great condition at this time of year and need only a simple preparation of garlic and lemon to let the natural flavours infused by our wood oven create a delicious entrée or main. This dessert is as good as it sounds. Made to order, this small pudding promises a delectable dark chocolate liquid centre, set off beautifully by a light Frangelico parfait, and the nutty flavours of the hazelnut macaroon. It’s quite a technical dish, but we think you’ll agree it’s worth the short wait. This dessert is full of surprises. If you’re expecting a slice of cheesecake, then think again, because this dish will delight with its unconventional appearance. Served in a glass coupe, it’s a deconstructed cheesecake, with a sweet raspberry and rosewater jelly base, a mascarpone cheesecake centre, topped off with ginger nut crumble and sliced, fresh strawberries which are currently in season. It’s delightfully different, elegant and big on flavour. Garfish Manly wins Best Seafood Restaurant in the Restaurant and Catering Awards for Excellence.